“And the Oscar goes to…” – this is the highlight of a year-round process of organizing the biggest event for the American film industry. Honoring the best and brightest film makers and actors, “The Oscars” is considered the most prestigious film awards ceremony in the world. The 87th Academy Awards have ended with Birdman being the biggest winner of the night (full list of winners). However, for the organizers after the awards is before the awards. This means that now they have to start planning the 88th Academy Awards. A top event like this needs to be planned ahead and the clock is ticking: only 365 days to plan and coordinate. The first thing that comes to mind when the word “Oscars” is mentioned is film stars parading down the red carpet in elegant gowns and accepting the golden statue on stage. This all would not be possible if there were not people behind the scenes who have spent a year planning and coordinating the event. Thus, the Oscars can be seen as a project and like any project it requires careful planning, resource and task allocation and communication, with the goal of delivering a glamorous and smooth running event that is being watched by millions of viewers around the globe. The goal is not just handing out awards to Hollywood’s most talented, but also to deliver a media spectacle to the millions of viewers watching the show on their TVs and as a result attract advertisers. Generating advertising revenue is important as the awards ceremony and the events around (such as the official after party, the Governor’s Ball) require a lot of budget. Last year’s Oscar season had a budget of $40.8 million and generated a revenue of $97.2 million (Source). The Dolby Theater (formerly Kodak Theater) seats over 3000 audience members, and around 1500 VIP guests have to be provided with the best service possible. This includes catering services, a limousine service, ushers and security and many more. These are the more ‘obvious’ tasks, but there are many small ones like the printing of invitations, preparing the voting ballots, seating arrangements, writing the script etc. that need to be taken into account. The Oscar season officially starts in January with the announcement of the nominees and a luncheon, afterwards the ballots are send out to the over 6000 Academy members and then the votes have to be counted. This all has to be organized as well. Right before the show begins, the venue has to be prepared: the red carpet has to be rolled out, journalists and photographers have to be provided with authorized access, the statues have to be prepared…the list of tasks is seemingly endless, but these are all necessary steps in order to deliver a finished and hitch-free end product, i.e. the awards ceremony. Communication is the key for an efficient process and for the success of the awards show. Trying to keep up with around 1000 staff members during the ceremony alone is difficult, therefore event coordinators need to communicate with them to make sure they all know the requirements of their specific tasks. Constant progress assessment and feedback is needed to ensure that everything is going according to plan and potential problems eliminated so that there won’t be any delays. During the show there has to be constant communication with the host of the show and the presenters, so that they each know where they have to be at what time in order for the show to progress smoothly. As I have already mentioned, the deadline for the Oscars is exactly one year and deviating from it is not an option. Therefore it is essential that every member of staff knows what their responsibilities are and in what time they have to finish their tasks. For some, the arrival of the film stars on the red carpet is as important as the presentation of the awards. This requires a minute coordination of arrivals of the guests, who will be driven in 750 limousines to and from the venue (Source). On the red carpet, interviews have to be done as quick as possible, as evident by PR managers hurrying film stars from one interview to the next. The awards ceremony itself lasts on average three and a half hours and thus, runs on a tight schedule. Acceptance speeches are limited to 45 seconds, officially to avoid long and embarrassing emotional speeches, but in my opinion it is probably more due to time constraints. Seemingly spontaneous events such as the pizza party and the now infamous ‘Oscar selfie’ last year were also planned ahead. At the Oscars nothing is left to chance. But despite careful planning there will always be unforeseen events, particularly at a live event that involves so many people before the cameras and behind the scenes. In recent years the event went pretty smoothly (at least from the viewer’s perspective, behind the scenes things might have been a bit more hectic), so besides maybe John Travolta mispronouncing Idina Menzel’s name last year or Jennifer Lawrence falling down on her way to receive her award the year before, there were no shocking moments compared to some events in the past (see The 10 Most Shocking Moments in Oscar History). The motto here is to “Expect the best. Prepare for the worst”. Therefore it is important to be prepared for any possible problem: in case of rain, a canopy has been erected as a cautionary measure, or if an acceptance speech is too long, music is played to cut them off. All in all, when organizing a big event such as the Oscars, it is important to plan ahead as carefully as possible, but to still be flexible when necessary. 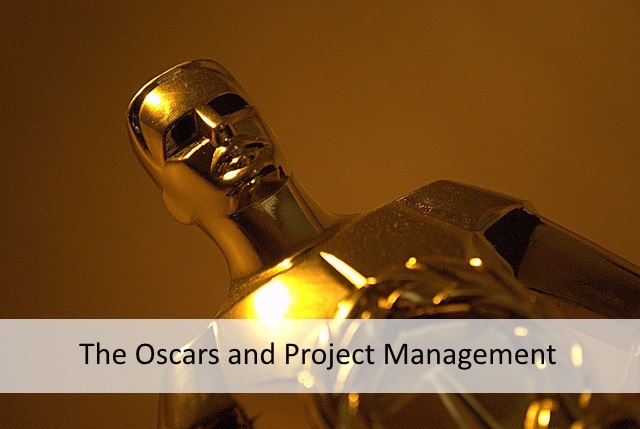 Planning “The Oscars” – The Project Management Perspective - InLoox • Copyright 1999-2019 © InLoox, Inc. All rights reserved.